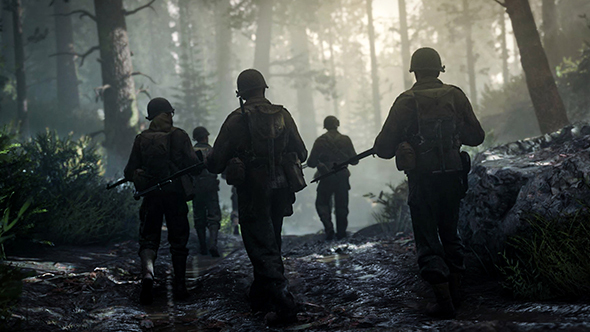 Sledgehammer Games makes up one-third of three studio line-up that manages to keep putting out new Call of Duty games at an annual pace. Michael Condrey and Glen Schofield are now leaving Sledgehammer after founding the studio over eight years ago. Condrey and Schofield, who together directed both Advanced Warfare and WWII, won’t be going far, however. In a statement provided to Kotaku, it’s confirmed the pair “have decided to transition from their duties at Sledgehammer Games to new executive duties inside Activision.” Senior development director Aaron Halon will take over as the lead of Sledgehammer. After collaborating to bring Dead Space to life, Condrey and Schofield left Visceral Games to found Sledgehammer in 2009. Sledgehammer’s first project was to aid in the development of Modern Warfare 3 with Infinity Ward, a studio which had just seen its own founders, Jason West and Vince Zampella, fired. It’s unclear with Condrey and Schofield will continue to work together on whatever’s next.